Will HealthCare.gov Get A California-Style Makeover? 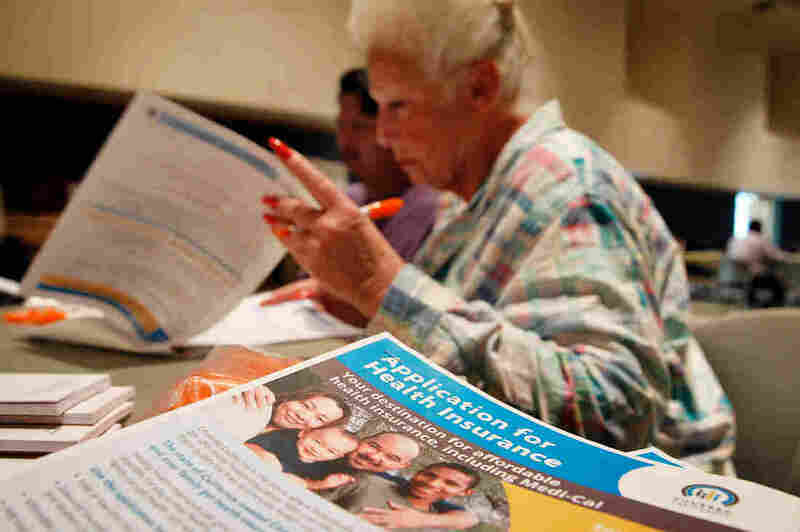 : Shots - Health News The feds propose taking a page out of Covered California's book and moving to a simplified marketplace for health insurance. Will HealthCare.gov Get A California-Style Makeover? Karyn Jackson (right) helped Fernando Rico, of Pasadena, Calif., complete a Covered California application for health insurance at an enrollment fair in 2014. When 28-year-old Charis Hill discovered that the cost of medication to treat her degenerative arthritis had risen to $2,000 a month, she chose to be in pain instead. "I felt like an invalid," said Hill, who lives in Sacramento and at the time had only catastrophic health coverage. She said the month without the medicine made it hard to get out of bed. Paying for drugs isn't a problem for Hill now. She has a more robust Covered California health plan, and she gets assistance from a drug company. As of the first of this year, she won't have to worry about sticker shock if she switches medications either. All Covered California plans now have a cap on how much patients pay for drugs: $250 a month in silver, gold and platinum plans; $500 a month in bronze plans, the least expensive ones. "I could try a better treatment," said Hill, a patient advocate, who says she is exploring that because her symptoms are becoming more severe. "The $250 is something I know that I can always fall back on." The copay cap on drugs is just one way Covered California chose to shape the health insurance marketplace this year. The California exchange uses more of its purchasing power to get what it wants than the vast majority of exchanges in other states. That means it decides which insurers can join the exchange, what plans and benefits are available and at what price. The federal government — in proposed rules for 2017 — has signaled it too wants to have more of a hand in crafting plans. Though there are no hints HealthCare.gov will go as far as a monthly drug copay cap, it would be forging ahead on a path California already blazed — swapping variety for simplicity in plan design. "Not letting [health] plans define what's right for consumers, but defining it on behalf of consumers ... is a better model for the market," says Peter Lee, executive director of Covered California. "We want to make sure every consumer has good choice but not infinite choice." Now, the federal government proposes to create standard cost-sharing designs in various metal tiers and make them easily accessible on HealthCare.gov. And it's considering how to improve value by being more selective about plans. A simplified marketplace, the feds say, will make it easier to choose high-quality health insurance. "Many consumers ... find the large variety of cost-sharing structures available on the Exchanges difficult to navigate," the proposed rules say. "We believe that standardized options will provide these consumers the opportunity to make simpler comparisons." The proposal signals a big change. "Up until now the federal marketplace has really taken a hands-off approach" in shaping the marketplace, said Sabrina Corlette, research professor at Georgetown University's Center on Health Insurance Reforms. "The new proposed rule says 'You know what? We actually are going to become more of an active purchaser.'" Covered California holds insurers to a higher bar than what's required under the Affordable Care Act. It negotiates premium prices down and requires quality goals to be met. Health plans must participate in health-disparity workgroups, collect information about enrollees' health status and monitor rates of preventive health services use. In the first two years, California's exchange rejected multiple health insurance carriers. Covered California says it's the only exchange in the country that requires all plans to be standardized (not just some, which the federal government is proposing). All gold tier plans, for instance, have the same costs for lab tests, doctors' visits and deductibles. "There was always a suspicion like, 'Oh, is that plan $80 more a month because it covers more?'" said Anthony Wright, of the advocacy group, Health Access. "And it was almost impossible to know. Whereas now people know 'Okay, these are basically the same plans.'" Price negotiations with insurers have paid off, according to Covered California. During 2016 plan year negotiations, insurers reduced premiums by 1 percent to 9 percent, said Lee. The exchange says this will result in $200 million in savings for premium payers and taxpayers this year. Covered California average premium increases have been on par with the increases in other states, according to the private health care consulting firm, Avalere Health. It says this year's 4 percent overall average increase was particularly low in comparison. But national researchers say the downward pressure on premiums may be more indicative of competition than the exchange's negotiating power. Health insurers in California acknowledge there's more red tape if they sell in the subsidized marketplace there, but surprisingly, they don't complain. In fact, a California insurance trade group says it sees the exchange as a partner, and active purchasing as valuable for establishing ground rules. "So far in California, it has worked," said Charles Bacchi, president and CEO of the California Association of Health Plans. The rules allowed new plans to get into the individual market, he says, and provided "more security in knowing what the playing field was." At the same time, Bacchi said, health plans don't always agree with the exchange's decisions. "There is give and take," he said. Blue Shield of California, which in 2015 had 25 percent of the exchange's enrollment, says it's very happy with its relationship with Covered California. Applying to sell through Covered California creates "different work" than was required before, said Ken Wood, Senior Vice President of Consumer Markets at Blue Shield of California, adding that he applauds its approach. But the business is worth it, he said. Covered California gives insurers access to more than a million consumers, whose monthly premiums are largely subsidized by government. And "the standard benefits is an enormous simplification for consumers," he said. But one of two health insurance regulators in California, the state Department of Insurance, said Covered California's strict guidelines may not benefit consumers. It has created a situation in which the exchange "has fewer carriers than would otherwise be the case," said Janice Rocco, deputy commissioner of the California Department of Insurance. More insurers in the marketplace for the first two years would have had an impact on price in the long term, said Rocco. Federal administrators may be trying to adopt active purchasing rules before the new presidential administration takes office, said Corlette, and California's example may make it more politically feasible. "There's no question that the feds are closely watching the California experience," said Corlette, commenting on Covered California's ability to keep insurers in the marketplace and hold down premiums. The federal rules also name other active purchasing exchanges as models however, including New York, Massachusetts and other state-based exchanges. Health insurers on a national level are "strongly" opposed to an active purchaser model for states served by HealthCare.gov, including standardized benefits. "It could discourage many from enrolling if they can't find a policy that works best for them," said Clare Krusing from America's Health Insurance Plans. "Where there is competition and choice is where consumers benefit and where health plans benefit," said Krusing. Researchers raise other logistical and market concerns. Caroline Pearson, senior vice president of Avalere Health, said the risk of losing insurers under active purchasing is "significant." "Right now the federal government needs to focus on increasing enrollment and maintaining plan participation," said Pearson. Streamlining benefits like medical service copays could get tricky when spanning across more than 30 states with different economies, said Corlette. Not all of Covered California's actions have been met with applause. Consumer advocates say they're still concerned about the high deductible in Covered California's Bronze plans, an amount the exchange chose to raise for 2016 plans. But at the same time, advocates appreciate that policy decisions aren't being made in the "back room of an insurance company." "Covered California has put itself apart from other states in that it is willing to be aggressive and do what's right," said arthritis patient and advocate Charis Hill. She said she's glad Covered California reminds insurance companies that they exist to serve patients: "If they're not doing their job, then somebody's going to step in." A version of this story first appeared on Kaiser Health News. Pauline Bartolone is a reporter for CALmatters, a nonprofit, nonpartisan media venture explaining California's policies and politics.